Gamespot’s Scott Butterworth rolled out a hands-on preview of Doom VR, the upcoming VR iteration of the 2016 release of Doom from id Software and Bethesda. The 740 word preview published on August 8th, 2016 titled “Doom May Have Solved VR’s Traversal Problem” was based on an early build that was showcased at this year’s QuakeCon. The preview garnered some interesting feedback from the community. Developers don’t owe customers anything but a working product. However, they definitely owe them something worth getting excited about otherwise they won’t have customers, and without customers you don’t have revenue, and without revenue you don’t hit profit margins, and without profit margins you lose your shareholders. So, technically, customers are a heck of a lot more important than shareholders. Additionally, a potential customer is exactly who previews are supposed to be made for. If Butterworth is indignant over someone reading a preview and asking for more information, then he’s obviously not writing for gamers. Perhaps they should add disclosures at the top of some previews letting people know it’s only for corporate shareholders and investors? That’s not to mention that someone interested in a game and requesting more information so they can make an informed purchasing decision is not being entitled, it’s called being an educated consumer. But even more than that, there is already footage up and available on YouTube from customers who bought and paid for Doom and bought and paid for an HTC Vive. You can see what it looks like in the video below from YouTube user SorryAboutYourCats. Now keep in mind this is not Doom VR but simply the 2016 release of Doom. It’s to show that if the average user can rig up recording software to record the gameplay experience, it doesn’t make sense why a major gaming publication can’t. Anyway, this is just another instance in the media thinking more highly of their position than what it’s actually worth. 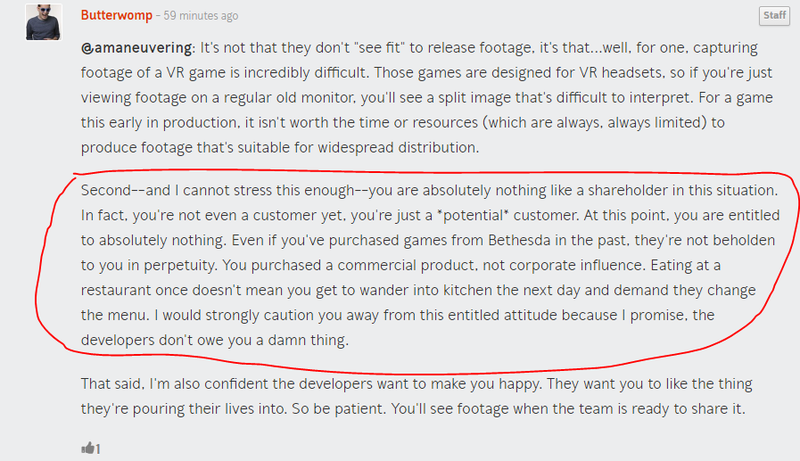 Their only value to gamers is in bridging information from publishers and developers to readers. A journalist’s job is not to assiduously work PR for the publisher, nor is their job to tell customers what information they shouldn’t be requesting, because at the end of the day every customer should be asking for as much information as possible in order to make the most informed purchasing decision possible. More than anything, journalists should be encouraging readers to ask, to pry and to want more information because an informed customer is more likely to return to a media outlet that they trust as opposed to a media outlet that tells them that they’re entitled and goes on a tirade about the importance of shareholders and corporate resource protection. Sadly, this is the very same attitude that led up to instances like #GamerGate happening in the first place.